I start with my “go to” yellow/vanilla cake recipe. It’s really good and moist. Now, I have used a boxed cake mix for this cupcake and it works great. In general, I really dislike that funny, overly processed chemical taste that boxed mixes have. So, if I do use a boxed mix, I doctor the hell out of it. I’ve had many people tell me and I have read on-line that people seem to prefer a boxed mix when it comes to yellow (vanilla) or white cake. Hmmmm. I dunno…..I just don’t know. Personally, 99% of the time I will make it from scratch, but in a pinch, I’m not opposed to using the boxed mix. I must say, a boxed yellow or white cake mix does produce a fluffier cake. I have made this snickerdoodle cake both ways. Both are good. But I will always prefer a cake made from scratch. I’m including the recipe for both here. Guess you’ll have to make 2 batches and decide for yourself which you like better! 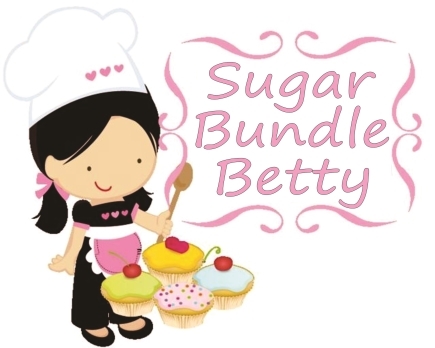 I will blog all about cake mixes vs. cakes made from scratch, later this week. You won’t want to miss that, because it really is interesting. Heat oven to 350. Line a muffin pan with paper cupcake liners. In a mixing bowl, mix together the dry mix, oil, eggs, soda and vanilla. Don’t overmix. 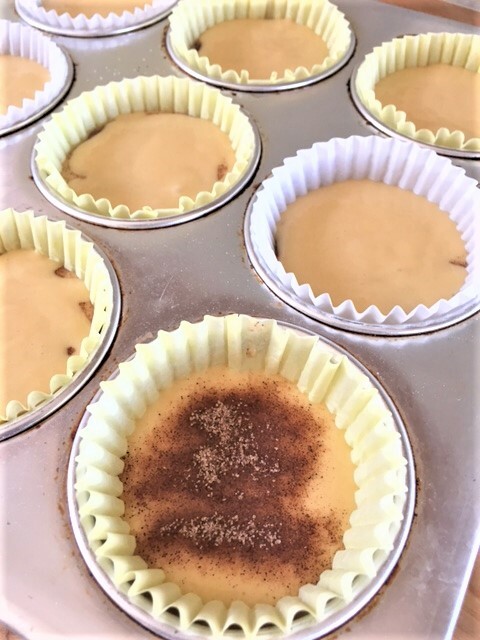 ** Once everything is thoroughly combined, fill each cup in the muffin pan with batter, about half full. Sprinkle about 1/4 tsp of the cinnamon/sugar mixture on top of the batter of each cup. 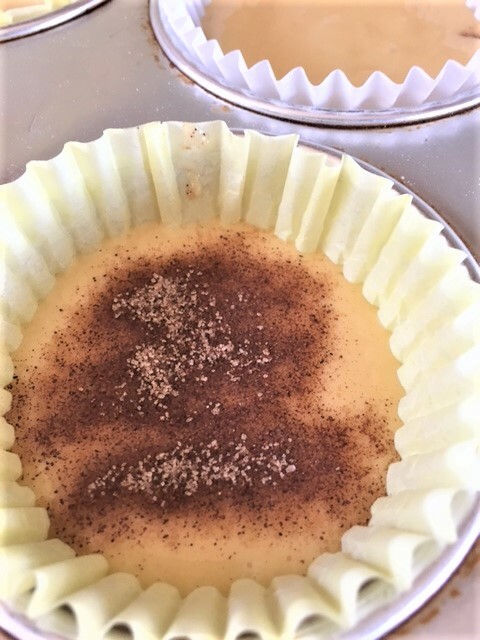 Carefully add more batter to each cup, leaving about 1/2″ from the top. 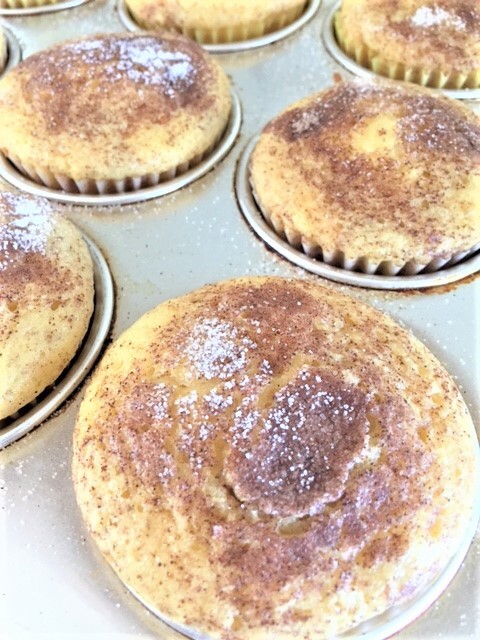 Sprinkle more cinnamon sugar on the tops of each cup. Bake for 14-16 minutes, depending on your oven. Allow to completely cool before frosting. Heat oven to 360. Line a muffin tin with paper liners. In a small sauce pan, melt the butter with the cup of water. In a large bowl, whisk together the flour, sugar, baking soda, salt and baking powder. Add the melted butter and water. Whisk until smooth. Add the eggs and vanilla. Stir in the sour cream until everything is well blended. Whip together the cream cheese, butter and vanilla until light and fluffy. Add the powdered sugar. Whip until smooth and creamy. If it’s too thick, add a few drops of milk. If it’s too thin, add more powdered sugar. 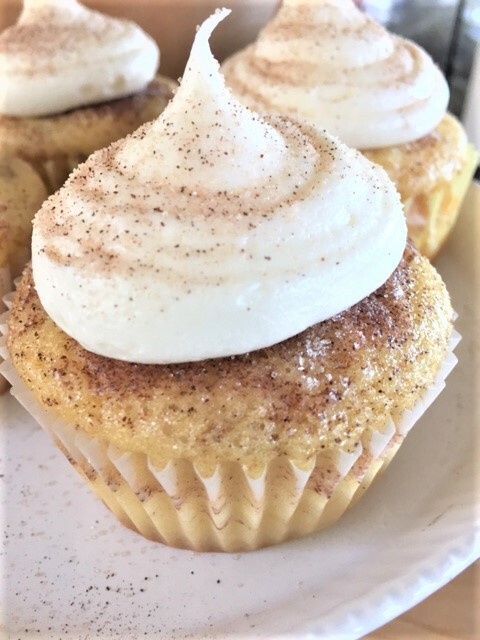 Once cupcakes are frosted, sprinkle more cinnamon sugar on top. So glad you released this one from the vault. Love this cupcake. Just need to see if I can do it as well. Brian, of course you can!! your’re a good baker person. 🙂 Let me know how they turn out when you make them.